Palau is a beautiful archipelago located in western Pacific Ocean. It is actually not that far from Philippines. Being a famous tourist destination, much of the job opportunities open for foreigners are in the tourism and hospitality sector, but not limited to. Currently here are the job orders that had been approved by POEA for Palau. Interested job applicants may contact the recruitment agency for further information regarding the job. 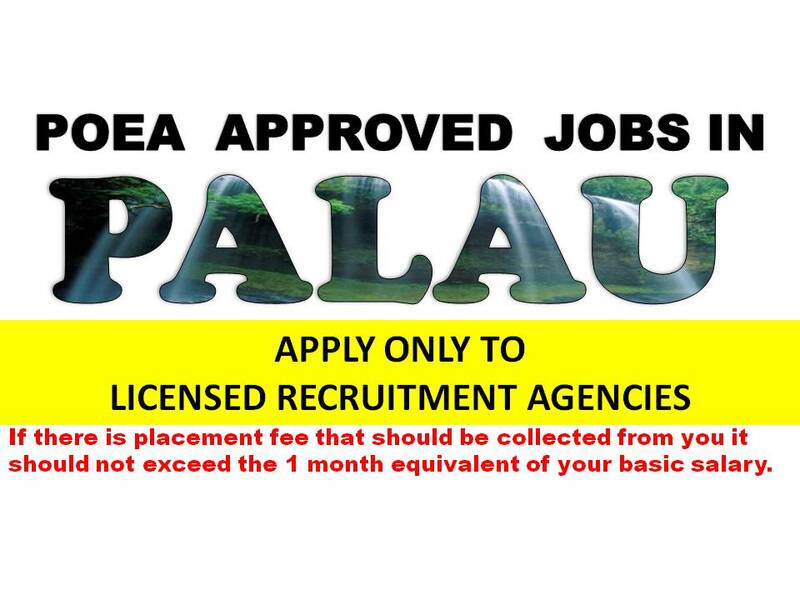 Should any of these agencies require placement fee for the job, the recruitment rule set by POEA states it should not be more than the one (1) month equivalent salary. Job applicants should only pay the placement fee once contract had been signed. Any violation on the placement fee policy or recruitment process should be reported to POEA and can be grounds for revocation of agency license. We are not affiliated to any recruitment agency. The information provided here are verified from POEA. Please report to POEA any violation on recruitment process.